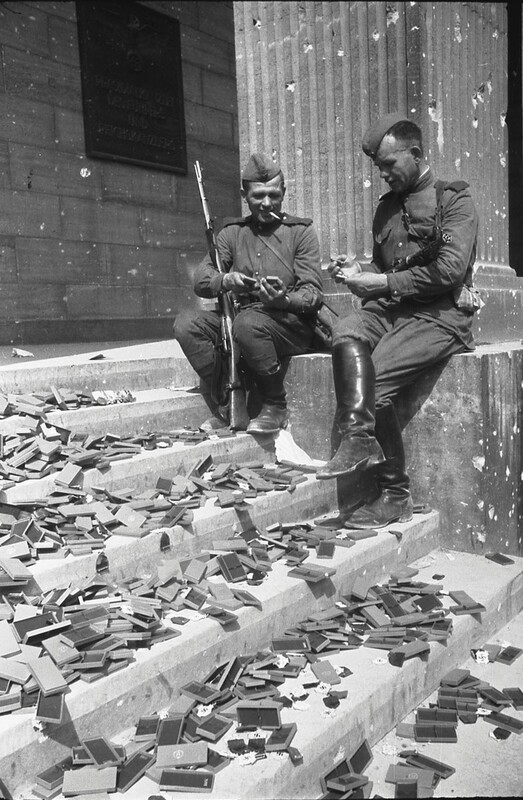 If I remember rightly from After the Battles superb article on wartime Berlin, they are boxes for Iron Crosses. I presume they got a job lot in for the glorious last stand of the 3rd Reich. Although on reflection they dont look like Iron crosses. Wound badges maybe? Ive a feeling they said that this is the Reich's Chancellery, but I wont swear to it. Edited by Stuart Galbraith, 15 April 2019 - 0930 AM. Medal boxes yes. Decorations were presented with a nice cardboard box and a deed (instrument? document? certificate? Urkunde) of ownership. Those dumb red army soldiers seem to have just taken the medals inside inside instead of the complete sets. Sheesh, no clue about collector value. Yeah looks like that to me. Good find. Supposedly around the same time he asked the LSSAH to hand in their cuff titles. So they handed them in, in a latrine bucket. Ungrateful bugger. Ive a collection of Soviet badges. Tanker 1st class, arm of service cuffs, that kind of thing. I keep meaning to get more, but the market at the militaria shows seems to have dried up of them. I did get a DDR Helmet for about 30 quid about 15 years ago. Im still pretty pleased about that. Genuine genuine, or Genuine my Mum knocked some of these up in the back room earlier? I might be interested in any Soviet Airforce stuff thats available. Strikes me its a curious thing we have never had a thread for the the exchange and mart of militaria. There's another story, possibly apocryphal, that they sent one back with the arm still attached. I guess this could be the reason both for the severed arm, and the armband of the 17th SS Panzergrenadier Division. Edited by sunday, 16 April 2019 - 1924 PM. And the narrative is that Germans have a limited sense of humour. Edited by Stuart Galbraith, 17 April 2019 - 0229 AM. Really 1st SS Panzer Division was all about the lulz. Edited by Adam_S, 18 April 2019 - 0640 AM. Yeah, its a wonder they didnt have a smiley as a cuff title really.